By admin , in Reasons of Back Pain on April 10, 2019 . Most people look forward to the golden years of retirement as a time for rest and enjoyable activities. Unfortunately, these years can also be a time for a new spectrum of back problems. Elderly individuals may still experience the disc herniations and muscle strains that are more commonly associated with younger people. However, older people witness not only the results of aging upon the spine, but also the aging of other organs that affect the spine. 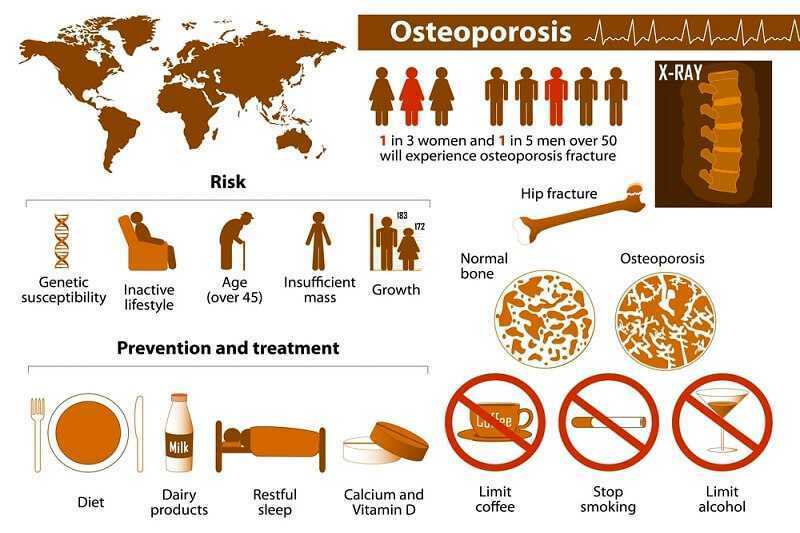 As time passes, everyone experiences osteoporosis in one way or another. Osteoporosis is a condition of aging that weakens the bones by slowly absorbing them. Women are affected earlier than men because women lose hormonal stimulation of the skeleton at menopause. Exercise and an adequate lifetime intake of calcium seem to slow down the process of osteoporosis. Although not usually painful, the results of this condition can be osteoporotic spines that are weak and can develop painful crush fractures (compression fractures) from a minimal injury. The squareshaped vertebral bones literally become compressed or crushed, often to less than half of their original height. This experience can be very painful and may last for 3 months or more. 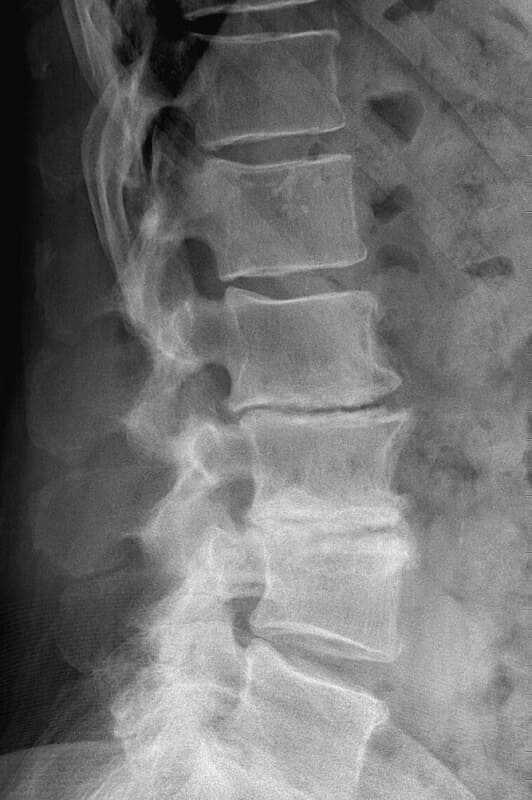 Not uncommonly, an elderly individual may develop these types of fractures from merely bending over. The bent-over appearance, sometimes associated with later life, is often caused by compression fractures that occur in several vertebrae. Arthritis of the spine is also commonly associated with older individuals. By the age of 70, approximately 75% of people will have significant x-ray evidence of degenerative changes in the discs and joints of the spine. Flexibility of the spine decreases, and often the spine bends forward in the upper back because of a combination of disc deterioration and loss of height of the bones as a result of multiple compression fractures. Although this degeneration of the spine is a normal part of aging and is not always associated with pain, many people experience frequent pain and muscle fatigue. You will know why this bent-forward position of the spine is tiring if you spend a single day walking in that bent-over position. The muscles of the spine have to work much harder when the spine is bent compared to when the weight of the body is centered over the vertebrae in the normal upright position of the spine. Causes of back pain in later life are often related to other organs of the body. Older patients more commonly have disorders of the kidneys, prostate, or uterus, for example, and these disorders may refer pain to the spine area. 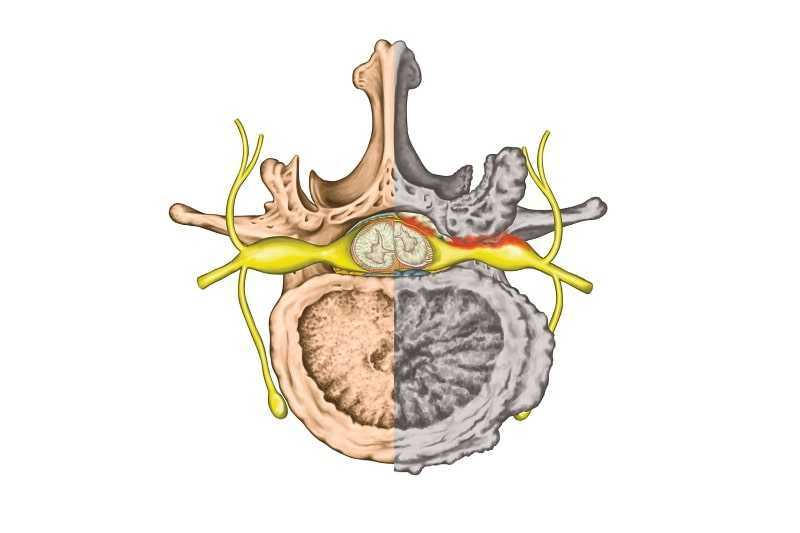 In a small number of patients, pain in the spine may indicate the spread of cancer to the spine from other sources. With all of these visceral conditions as possible causes for back pain, it is easy to understand the importance of a careful medical evaluation in all elderly patients who have persistent spinal pain. What about nerve problems in the elderly? When back pain is associated with pain that radiates down the leg, particularly into the lower leg, this condition is often called sciatica or radiculopathy. Among the young, this pain usually indicates injury to a spinal nerve by a herniated disc. In older patients, this pain is the result of spinal stenosis, which literally means narrowing of the spine. In this condition, the spine does not have enough space for the nerves. With aging, the associated thickening of the bones and ligaments, bulging of the discs, and bone spur formation take up some of the space that the nerves would normally occupy. Certain body positions further reduce the amount of space within the spine, which would not be a problem in a normal spine. But when activities or positions compromise the space within an already narrowed spine, pressure is applied to the nerves, and pain radiates into the areas where these nerves travel. In the case of stenosis in the lower back, these nerves extend into the legs, so the pain extends into those areas. Stenosis usually develops so slowly that the body can adapt to the loss of room for the nerves. Because of the human body’s tremendous ability to accommodate gradual injury, significant symptoms are rare until the process is fairly advanced. Although some people eventually require surgery to make more room within the spine, the majority control their symptoms with rest, avoidance of painful activities, and mild medication. Spinal stenosis may occur in young people who are born with narrow spinal canals, but the condition is most commonly associated with aging, for the reasons just described. Are lower back problems in the elderly treated like those in young people? The treatment of back pain in all individuals takes into account many factors. A person’s age is certainly important, but it is not the only consideration. For example, an active 65-year- old person may be healthier, stronger, and more flexible than many inactive 35-year-olds. The category of patients that can be described as elderly is very heterogeneous. A 68-year-old person who is still working full-time and engaged in sports activity is very different from a 95-year-old person who lives independently, but requires a cane to walk. In general, people over the age of 55 to 60 should have more extensive and earlier testing than a younger person would need to rule out a visceral cause for their back pain (for example, internal organ failure or cancer). Medication is also more of a concern since older individuals seem to be more sensitive to side effects. Strong pain-relievers such as narcotics should be used in low doses, if at all, in order to avoid confusion and depression, particularly in the very elderly. Numerous reports have described organ damage, such as injury to the kidneys and stomach ulcers, from the use of even such mild medication as aspirin and ibuprofen. These medications can be used safely, but require careful monitoring. Exercise is an important part of treatment in the elderly patient, but needs a careful design that avoids injury to bones and joints that are often ravaged by osteoporosis and degeneration. This exercise program is not strictly agedependent, but is instead individualized based on a careful evaluation that includes measuring such factors as flexibility and strength. 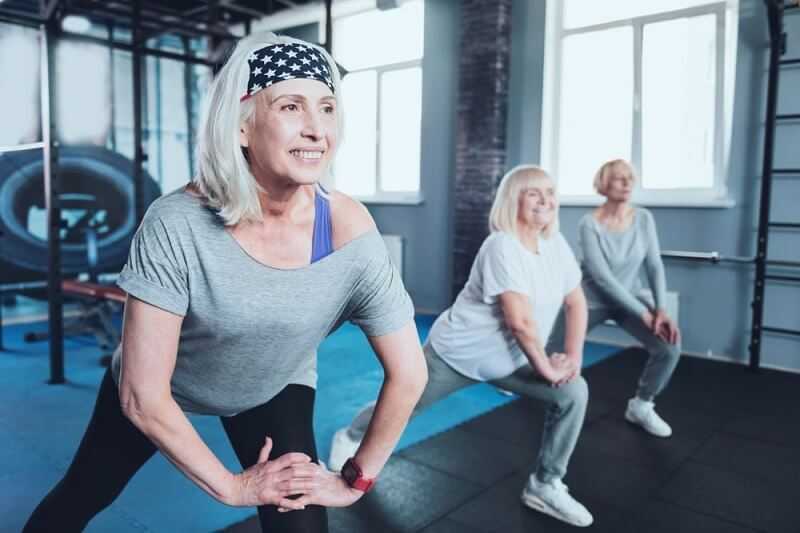 Other medical conditions that commonly afflict the elderly, such as heart disease or diminished circulation, must also be considered in the design of an effective exercise program. A physical therapist with experience in treating older patients with back pain can be very helpful. Almost anyone can start with a walking program or a swimming program such as those commonly available at community health centers, which have programs designed for older people. Exercise promotes a sense of well-being, strengthens muscles to reduce fatigue, slows osteoporosis, and helps maintain range of joint motion. If the back problem is severe, then consultation with a physician and physical therapist should result in an individualized program that takes into account many of the factors described. In summary, treatment of back pain in the elderly usually includes prudent medical evaluation, lowdose mild analgesics or arthritic medications, and careful exercise programs. 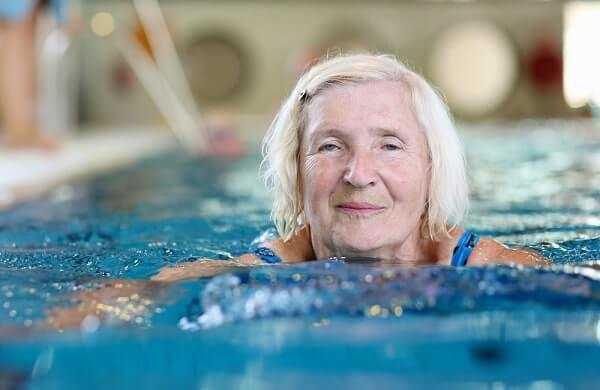 A general rule for older people with advanced spinal degeneration: Exercise when you can; rest when you must. In other words, take advantage of the days when you are feeling well to exercise. On those days when you are fatigued or when the pain is severe, it is more appropriate to rest.